Reliass is proud to announce that Lt Col Jeff “Spanky” Peterson will be giving the keynote presentation at the 2015 EAGLE Users Conference. Lt Col Jeff “Spanky” Peterson was born and raised in Logan, Utah. 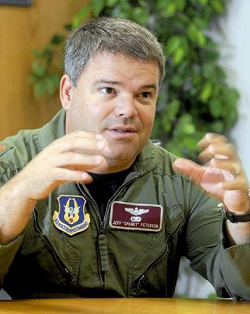 He graduated Air Force ROTC from Arizona State University in 1991 and went on to complete Pilot Training at both Laughlin AFB, Texas (jet aircraft), and Fort Rucker, Alabama (helicopters). Lt Col Peterson has flown over 3000 hours in the HH-60G at Nellis AFB and a classified duty location, in Nevada, Patrick AFB, in Florida and also Davis-Monthan AFB in Tucson, Arizona. He has deployed numerous times overseas three of which to Afghanistan (2005, 2007 and 2008). Lt Col Peterson is currently working as an Operational Test Pilot at the ANG/AFRC Test Center and is also volunteering as a Scoutmaster for Troop 203 here in Tucson, Arizona. Lt Col Peterson, and his wife Penny (who is a Tempe, Arizona native) currently reside in Tucson, and have 4 boys. Check the link below for additional information about EAGLE!